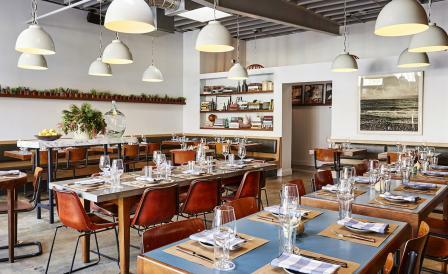 Los Angeles-based interior designer Heather Ashton has joined forces with chef Stephen Kalt - of Iron Chef fame - to launch Spartina, a re-introduction of the restaurant Kalt originally opened in New York’s Tribeca neigbourhood in the 1990s. In the L.A. rendition - located on a stretch of Melrose Avenue that’s having its own resurgence - Kalt marries Italian dishes with ingredients from the region’s local farmers’ markets. The result: a Cal-Ital trattoria that puts more emphasis on fresh and seasonal than checking all of the expected Italian-restaurant boxes. Dishes like grilled avocado with Moroccan lemon, Calabrian chilies and ricotta salata feel rooted in an Italian cooking heritage, yet with a decidedly Californian flourish. To match the tone set by Spartina’s menu, Ashton has created a well-considered, unfussy and easy-going aesthetic; the almost industrial space - with concrete floors and exposed beam ceiling - is made warm with the addition of natural elements like wood wall cladding, leather-embellished seating and plenty of live greenery. French blue tables and cabinetry lend a hit of colour to the restaurant’s otherwise neutral palette, while landscape photography taken by Kalts wife, Shelley, is also on display.